From Hero Arts, this stamp set contains four birthday related messages and greeting: "it's your birthday", "Happy Birthday", "Happy Everything To You" and "Cake and Ice Cream". 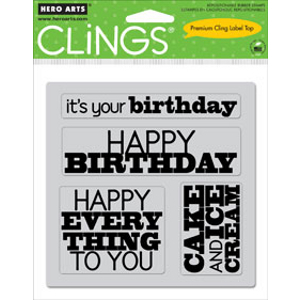 These cling stamps are deeply etched from top quality rubber for a lifetime of use. They cling to acrylic blocks and have a full-sized indexed label for precise and easy placement.